Sometimes all you need is a trip to Utah with your best friend. I had hit my wall with writing. I would circle around a subject, draft three pages of dribble, and then quit without saving. My words fell flat and I blamed it on the redundancy of my life. I would wake up, walk Zep, work 10 hours, walk Zep again, and go to sleep. Of course this is melodramatic. My life is full of baby snuggles and trips to the top of the Empire State Building. But when I sat down to write, my brain went blank. And then I went to the desert. As someone who finds peace in being outside, I knew that the national parks of Utah would steal my heart. I had seen pictures and read enough Terry Tempest Williams to know that this part of the world holds an unmatched beauty. Everything around me was painted in red. The spires were as tall as skyscrapers, the canyons as deep as the ocean, and the dry air was filled with the scent of sage and sunshine. Tracey and I did what you’re supposed to do on vacation, we meandered. When we wanted to hike, we hiked. When we wanted to drink beer, we drank beer. When the thunderstorms rolled in and the thought of setting up camp sounded awful, we got a cheap motel room and acquainted ourselves with the joys of Moab. We read books and made fires. We went to bed early, snuggling deep into our sleeping bags to fight off the bitter cold of desert nights. We chased the sunset at the grand canyon, running in flip flops to make sure we caught the moment the sun dipped low enough to paint the canyon walls a deep purple. 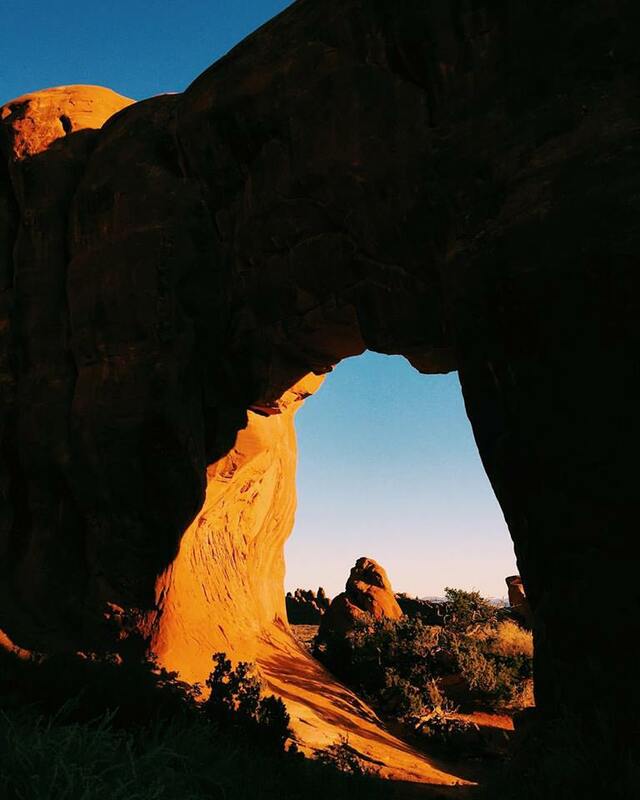 On my favorite morning, we drove to Zion as the sun was rising and spent the morning in the Devil’s Garden. Scampering up rocks and wading through puddles turned to pools, we found ourselves on the top of the world. And, because we’ve been best friends since birth, we ended the trip in Disneyland. While that place is hell to some people, it’s the place we have always associated with magic. Acting like kids in a candy shop, we got there before the gates opened, making a mad dash to be the first in line for Space Mountain. We made a list of all the must-do rides, eating sickly sweet churros and mapping the best route to avoid the children on the verge of breakdowns. There is no one I would have rather done this trip with, and I came back a completely refreshed human. There is so much perspective to be gained when you take a step out of your life and sink into a place of grandeur. The world is such an epic place and we are such tiny blips. So many of my concerns are in trivial things that don’t matter in the grand scheme of things. There were so many ah-ha moments on this trip, and I am back to feeling like myself. I came home with a very solid grasp of what’s important, and I am determined to move through life full of that desert joy. Who knew Utah would give me so much? It’s no surprise that tacos are my favorite food. When shopping for our trip, we knew the first meal on the menu were camp tacos. They are easy, they are delicious, and they can be repurposed in the morning for breakfast tacos. This recipe is best accompanied with a campfire and a cold beer, but if those aren’t in your near future, you can enjoy them in the comfort of your home. Side note: we forgot beans so we substituted chili which was weirdly delicious. I think y’all know how to make a taco. But here’s how to do it while camping. Step one, have a headlamp if, like us, you come back after dark. Forget a sharp knife? US TOO! We had a weirdly sharp butter knife, and I only nicked my finger once. Chop up the onion, bell pepper and kale while the oil is heating. Saute onion first for 3-5 minutes, add in the bell pepper and sauté for another 5 minutes. Add in the chili or beans, as dirtying another pan would be silly when camping. Lastly, add in the kale and let wilt for another 2-3 minutes. Add in your spices and let everything simmer. We transferred all of that to a bowl and cooked our eggs in the same pan because camp dishes aren’t fun. Warm the tortillas over the fire, and then pop your veggie/bean/chili mixture on there, and add some avocado, sour cream, and salsa. Lastly, put an egg on it. Today I will thank my ankles. I will spend some time with my shoulders. I’ll get to know the back of my knees. Some days are thick with self-deprecation. Comments wrapped in humor (being cruel to yourself is okay as long as it’s cloaked in silliness, right?) Beauty is such a fickle beast. So much value balances on its very unsteady definition and we walk the tightrope with so much blame and loathing in our heart of hearts. When I see a woman like Denise Jolly, I get misty. Be Beautiful. Such courage and grace in her photographs, in her words. Beautiful. Fierce. Joy. Sadness. Sass. Meet your body where it’s at. Wherever that may be. Greetings my darling, thank you for all that you are. Since moving to Texas, being a “vegan” has changed to eating a plant-based, whole foods diet with the occasional dalliance into the land of dairy. I missed cheese. I missed yogurt. So on occasion, when my body tugs on my shirt and asks, “can we? please?” I give in. What can I say? Self love sometimes looks like fresh ricotta. This recipe is from Smitten Kitchen. The original recipe calls for raspberries, but strawberries were at the store, looked better and I adore them… Let me tell you, these are scones to write home about. Preheat the oven to 425 degrees and line a baking sheet with parchment paper. In the bottom of a large, wide bowl, whisk flours, baking powder, sugar and salt together. I couldn’t locate my pastry blender, so I just used my hands. Cut the butter into small pieces and work it into the flour mixture with your hands until the biggest pieces of butter are the size of small peas. Toss in the strawberries and mix in. Add in the ricotta and cream together and stir them in to form a dough with a flexible spatula. Using your hands, gently knead the dough into an even mass, right in the bottom of the bowl. Transfer the dough to a well-floured counter, flour the top of the dough and pat it into a 7-inch square about 1-inch tall. With a large knife, divide the dough into triangles or squares (whatever tickles your fancy). Transfer the scones to a prepared baking sheet with a spatula. Bake the scones for about 15 minutes, until lightly golden at the edges. Cool in a pan for a minute, than transfer to a cooling rack. It’s best to cool them about halfway before eating them, so they can set. These are definitely a scone to make in the morning, right before brewing your coffee. They tasted like heaven right out of the oven, like amazing town a few hours later, and pretty good that evening. They are meant for sharing. Remember how awesome it was to be a little kid? How you spent so much time in your own head, imagining that your backyard was a pirate ship, your bike was a horse and the woods were your make-believe home? My bestie and I would spend hours on her acre of wooded property, making forts and sneaking into the neighbor’s yard to feed apples to their horse. Yeah, my youth was pretty idyllic. I am not sure that outside-all-day, berry-picking, lost-in-the-woods, be-back-by-dusk childhood is all that common anymore. Maybe that is why the childhood obesity rate is 16.9% and why it isn’t uncommon to see seven-year olds with Iphones. What a strange world we live in. I have decided that if I have kids they will wear recycled pillow cases (fashioned into draw string like dress bags), they will play with wooden toys, live on a farm, play in the dirt and never interact with the outside world. Which means I will live on a commune or be a part of a cult…? Never let me have children. I think about kids a lot because I work at a hospital; a hospital that only treats kids. A place where there are a lot of kids who are really sick. It makes me think about how many kids there are that aren’t battling cancer, that aren’t going through chemotherapy every other day, but are still slowly decreasing their chances at a healthy life because of the world and society around them. Heavy stuff this morning, I know. All of these thoughts led me to sign up as a running buddy for an incredible organization. Girls on the Run is an international non-profit that runs a 10-week after school program for 3-5 grade girls. It teaches them about positive body image, self love and trains them for a 5k. Basically, it rocks my world. I spent my Monday afternoon running (let’s be real, it was mainly walking and then sprinting down hills) 3.5 miles with two 3rd grade girls. They were the cat’s pajamas. We talked about school, family, pets, their hopes to go to college together, live together and work as zoo keepers together (bless). It was the best way to spend a Monday. It reminded me that kids are resilient. That perhaps there is a bit of hope when it comes to the next generation. 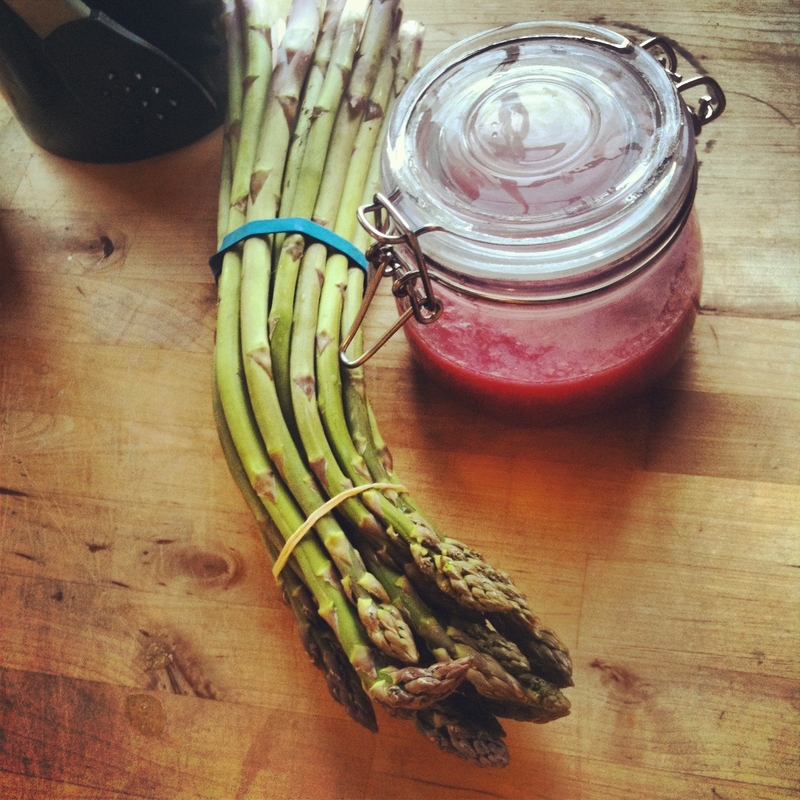 To top all of this magic off, it is spring and that means rhubarb and asparagus (I am lacking a smooth transition today, oops). After eating a breakfast of vegan, gluten-free banana pancakes with homemade nutella (what?!? So delish) at my favorite spot for a bestie’s birthday we popped by the Ballard Farmers Market. Perfection looks like bundle after bundle of fresh asparagus. It looks like baskets of fern fronds and bushels of arugula. Perfection is the realization that we are entering the time of year when eating local produce is easy. SO. MANY. VEGETABLES. I bought the rhubarb on a whim. Mainly because it was so beautiful and my excitement got the better of me. This spontaneous purchase resulted in making a batch of rhubarb compote—one of the easiest things to make in the world. This delicious, honey sweetened concoction is best when plopped on coconut milk yogurt or ice cream. Highly recommended. -Wash and cut up rhubarb into thin chunks. -Place all ingredients (except honey) in a small saucepan and bring to a boil. -Reduce to a simmer and cook down until rhubarb is soft—about 15/20 minutes—stirring occasionally to prevent sticking. -After the compote has cooled, pour through a fine sieve to get rid of the excess liquid. -Add the honey and stir everything together. -Put in an adorable jar and pop on whatever tickles your fancy. I have a giant zit on my chin. My head also feels like it is full of fluff, and I am working a ten-hour shift. So here is my cliché new years resolution list for 2012… Yes, most of it involves running, veganism and yoga. Deal with it. 1. Practice yoga at least four times a week. This means going to a class four times a week. The other three days, at least incorporating some sort of meditation/yoga/stretching into my daily life. YOGA EVERYDAY. 2. Diversify my vegan diet. Spend more time with kale. Use the new immersion blender/regular blender (my mom thinks vegans eat a lot of soups and smoothies) and make magic in the kitchen. 3. Continue training for my full marathon. RUN RUN RUN. 4. Allow myself space to be quiet. To sit and do nothing. To not plan every minute of every day scheduling something. Meditate. 6. Climb Mt. Baker– I will succeed in reaching the top of a mountain and once again reveling in the fact that our bodies can do amazing things, and this world we live in is a beautiful place. 7. Allow myself to be a quirkyalone for as long as I want. I refuse to ever settle, even if the loneliness sets in and the world tells me to fall in love for the sake of companionship. 8. Start a girl band with my friend Molly. She will play the ukulele. I will play the banjo. 9. Learn to play the banjo. 10. Make time for my friends. Always. Long walks with the dog. Chats over tea. Girls night out. Sessions in the sauna. I am the people I surround myself with. My friends are my sanity. Here is to you 2012. Lets make my 25th year EPIC.